If you were to think "I’ve heard this before" when listening to the unlisted instrumental kicking off 'Haath Ki Safai', you wouldn't be mistaken. The melody sounds just like Henry Mancini's theme from 'The Thief That Came To Dinner', which isn't unusual in itself; Bollywood MDs did that sort of thing a lot. What's surprising is that just a few months later, Kalyanji Anandji used the same melody again for their (now quite famous) instrumental from 'Rafoo Chakkar'. They must really have liked Mancini’s original. It precedes 'Wada Karle Sajna' and combined they are the best thing on this soundtrack. The song is beautiful; a soaring melody, sumptuously orchestrated with a cool rolling rhythm. 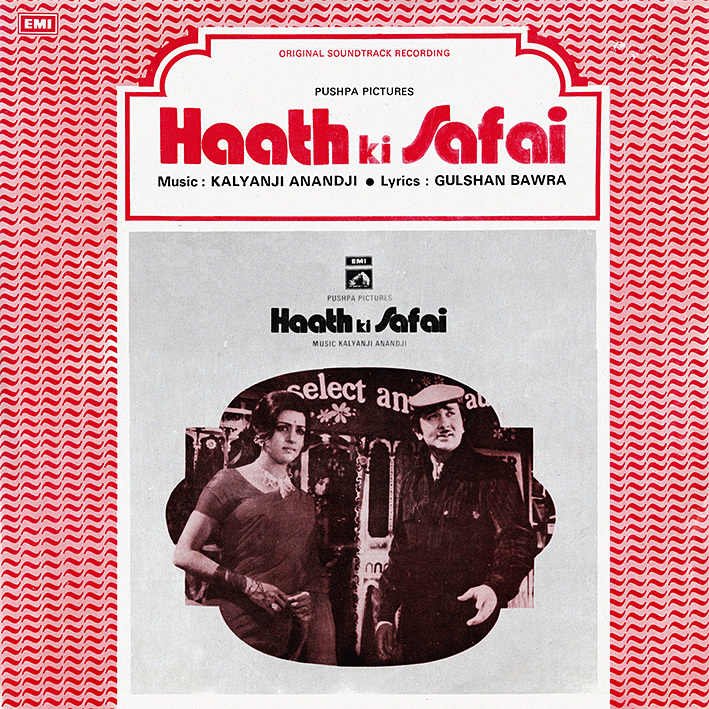 I quite like 'Ham Ko Mohabbat Ho Gai Hai' too, a pleasant if unspectacular pop tune with nice instrumental details, including a Morricone-ism or two. Cabaret number 'Too Kya Jane O Bewafa' follows Kalyanji Anandji's trademark funk pop formula; similar in style to their own 'Ae Naujawan Hai Sub Kuchh Yahan' but without being quite as good. Or as funky. Excellent! May god bless you PC. Looking forward for new postings. pc, I had one browser block the downloaded archive, saying it had detected some kind of nastyware. However, I ignored that because in all the years of downloading from your blog, there has never been any kind of nastyware. Instead, I downloaded the file in a different browser, and scanned it with two different antivirus apps before opening it. They of course, found nothing bad... because there was nothing bad to find! Bit of a minefield, navigating file hosts these days, what with pop-ups and false leads and dodgy warnings... glad you found your way around it! Thank you. Zippy share works perfect.